If I told you I was writing to you from the "Financial Capital of the World" or the "Entertainment Capital of the World" you could probably conclude that I was in New York City and Las Vegas, respectively. But how about "The Water Park Capital of the World" (no Googling allowed)? If you guessed Wisconsin Dells, WI, you'd be correct. Never heard of it? I hadn't either, but millions of Mid-Westerners have been vacationing at "The Dells" for more than 150 years. The Dells are a series of sandstone rock formations and steep bluffs scattered along the Wisconsin River, remnants of the last glacial melting in the area some 15,000 - 20,000 years ago. By the mid-1850s, city dwellers in Chicago, Detroit, and the like, sought out the rugged beauty of the Dells and the cooler air of the Wisconsin River foothills. The town of Wisconsin Dells sprung up on the banks of the river, and by the turn of the 20th century it was THE place to beat the mid-western summer heat and humidity. Today it is visited by over 1.2 million people annually, and TripAdvisor's 2010 Travelers' Choice Awards declared Wisconsin Dells the "#1 Family Vacation Destination in America". This probably has more than a little to do with the aforementioned water parks. I am not sure by what criteria one determined the "capital of the world" status of anything, but here are some stats about Wisconsin Dells and their water parks for you to chew on: largest concentration of indoor and outdoor water parks on Earth; largest outdoor water park in the U.S.A. (70 acres); largest indoor/outdoor combination water park in the U.S.A.; the only "loop-de-loop" water slide anywhere; and more than 200 individual water slides. I'm thinking that probably constitutes a capital city, if not a kingdom. It's not possible to hit all of them in one visit, but I gave it a good run. I think the only thing that could be possibly more fun than experiencing these attractions would be getting to name them. Some of my personal favorites are: Poseidon's Rage, The Black Anaconda, The Flyan Mayan, Demon's Drop, and The Howlin' Tornado. That last one is in the family of rides known as "funnel slides," which as the name suggests, sends you down a series of concentric circles, until you are unceremoniously flushed out of the bottom. It is this final action that has earned them the unfortunate monicker of "toilet bowl" slides among the faithful. I am not crazy about the role that I - as the rider - play in that analogy, so I am sticking with "funnel slide". There is a lot more to the Dells than just water parks of course. I highly recommend a guided boat tour of the Dells formations themselves. It is an extremely enjoyable way to see them up close and to get out on the water. Also, the Lost Canyon horse and wagon tour is fantastic. Since 1956, tourists have been touring the longest and deepest land canyon in Wisconsin, via a guided horse-drawn wagon. The town of Dells itself is - how can I put this - honky. You couldn't cram another neon sign, fudge shop, ice cream parlor, or miniature golf course into a dozen or so blocks - or at least you wouldn't think so. Needless to say, your kids will love it. And there are a few gems tucked away here and there, too. I highly suggest dropping in at H.H. Bennett Studio - a museum, shop and former studio of the photographer who helped make Dells famous. The food and people watching from High Rock Cafe are also worth your time. As for lodging, try a timeshare rental at Christmas Mountain Village. It's located in a quiet and heavily wooded area just 4 miles from downtown Dells. In terms of units, they've got everything from free standing cabins to attached villas. I picked up a 2 bedroom/2 bathroom unit with a view of the golf course with a deck and barbeque for just $75. RedWeek members rate this place 4-stars, and I have to agree with that assessment. Well, I am heading about a half an hour south to the quaint village of Baraboo. It is home to the International Crane Foundation - where you can see all 15 crane species and their captive breeding and reintroduction program; Devil's Lake State Park - Wisconsin's most visited park and home to great hiking and swimming; and the home of the Ringling brothers. That's right, the five brothers started their little circus in Baraboo, WI, in 1884 and it remained their winter home for 34 years. In 1918 they bought the Barnum & Bailey circus and became the "Greatest Show on Earth". But the era of the great seasonal "railroad" circus was drawing to a close as it was moved to indoor venues and could stay on the road indefinitely. The winter home back in Baraboo was converted to Circus World which is both a museum and a functioning daily circus. Each day they have a full schedule of events and activities, including two big top circus performances. 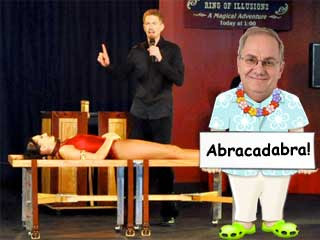 But I am hoping to catch the "Ring of Illusions Magic Show" at 1:00 PM, featuring the magic and comedy of Tristan Crist. You may not know this, but I consider myself to be a fairly accomplished magician. I hear this kid is good, and even goes so far as to perform Houdini's famous metamorphosis. That's the one where the illusionist switches places with an assistant locked inside of a wooden trunk in just the blink of en eye - and I have no idea how it is accomplished. I am going to get the best seat I can, and hopefully pick up some insight. So far all I have managed to do is get myself locked inside of the trunk. Twice. The second time I had to promise the EMT crew rescuing me that I would never try it again, and they made it very clear they would not respond to any future calls from my residence. So one way or the other, the third time is going to be the charm.